Hey remember back in December when we all thought this would be a close, tight, unpredictable, deep field? 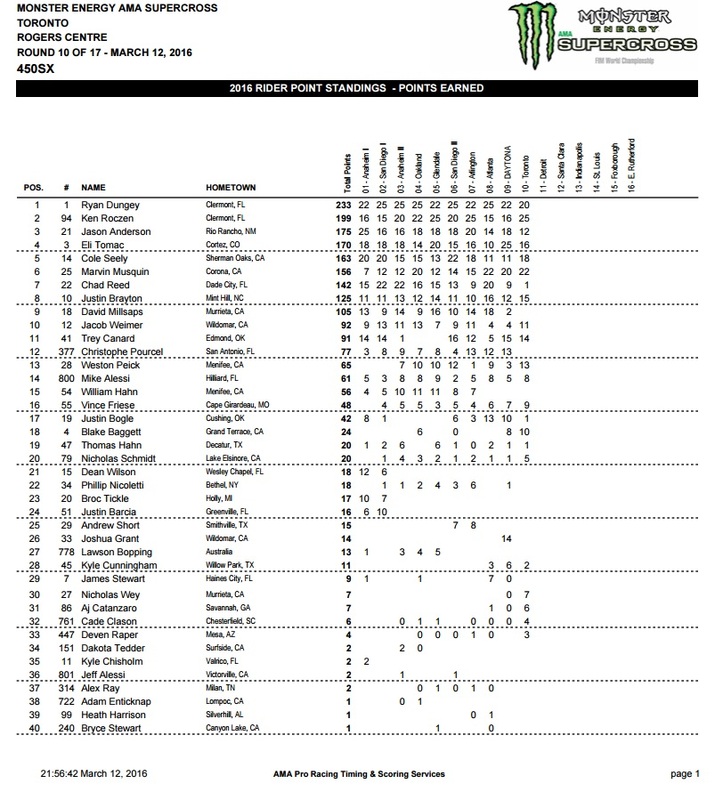 Well, have a look at the last four races, which feature two wins by Soaring Eagle/Jimmy John’s Suzuki’s Ken Roczen, a near-win by Red Bull KTM’s Marvin Musquin, a Daytona win by Monster Energy Kawasaki’s Eli Tomac, and a win mixed with solid consistent results by Ryan Dungey. 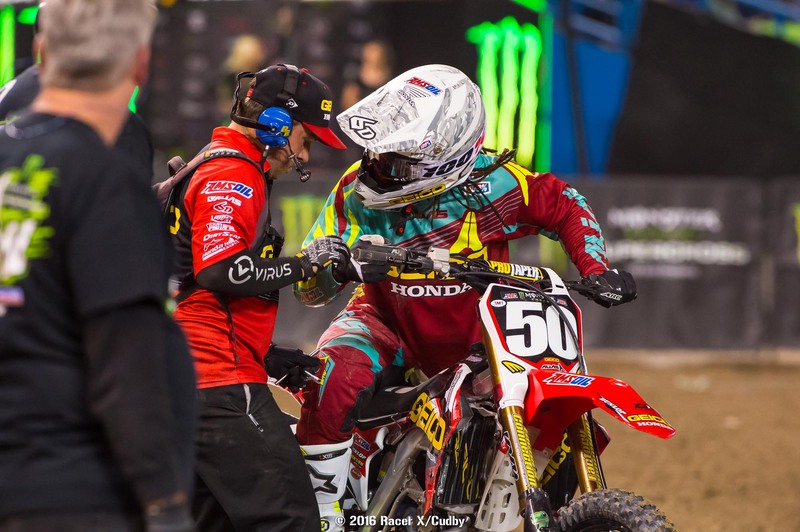 That five pack has been mixed up every week, plus Chad Reed had an Atlanta podium, and others like the Honda HRC duo of Cole Seely and Trey Canard are fast, BTOSports.com KTM’s Justin Brayton has been in there, as was his teammate Davi Millsaps before an injury last week. Seriously, the last four races have been what we wanted to see all season! Roczen’s win is proof of the new level of unpredictability. His Dallas win seemed to signal a turnaround, but then his starts were terrible the last two week and he ended up deep in the pack. Then it was Eli Tomac coming in with the momentum after Daytona, and of course Dungey has been a machine. So who would have thought that Dungey would lead this one early, Tomac would pass him for the lead, but then Roczen would knife past them both to pull away for the win? You just can’t figure out what’s coming next right now! On this night, Roczen was rock solid, no doubt. But does it mean he’ll ride like this next week? We don’t know! Justin Bogle actually grabbed the holeshot on his GEICO Honda but then totally blew the first rhythm lane, overjumping a triple and landing in the face of the next jump, and then crashing in front of the whole field. Bogle was plenty willing to take the blame for that one, saying he ended up on the opposite side of the track from the line he had been using all night, and basically mistimed the jump. Luckily he was okay, but he ignited a huge pileup, and also damaged his bike beyond repair, ending his race. Once Roczen passed Dungey and Tomac he was gone. But don’t think Dungey is just resting on his points lead. He tried pushing hard to catch back up to Kenny and ended up sliding out. He didn’t crash but lost time, allowing his teammate Musquin to get by him and steal second. Musquin has been riding really strong as of late, and when Dungey tried to reel him back in, the Frenchman held strong for a solid second. “I held off Ryan all the way to the end, unlike in Atlanta,” said Marvin with a laugh. Dungey’s third is his worst finish this year. Read that back again. 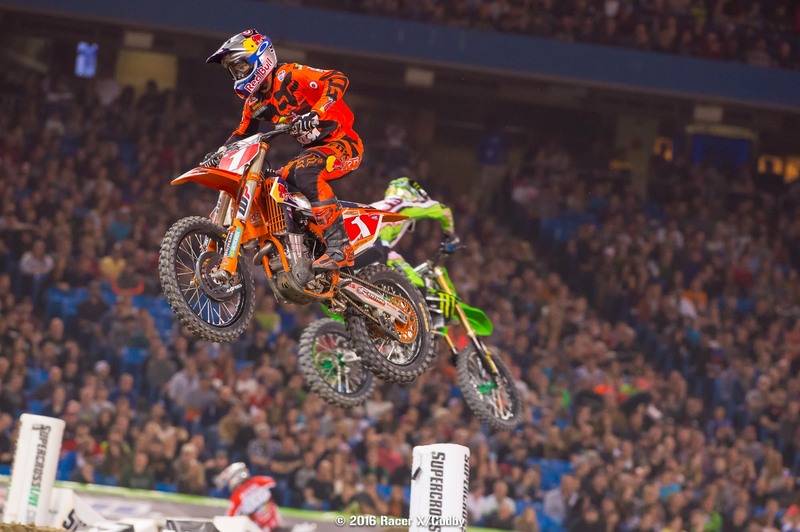 The podium finish also makes history, as he now has the all-time supercross record of 26-straight trips to the box. 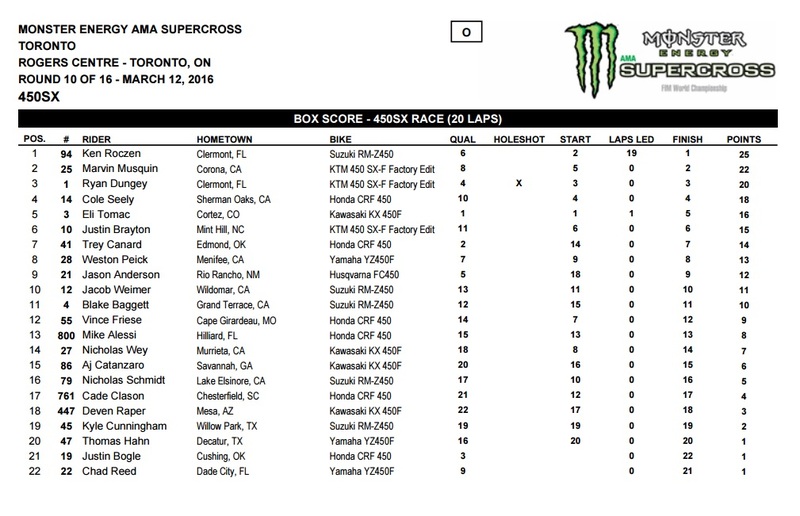 Cole Seely rode solid, not quite able to catch Musquin or Dungey ahead of him, but he did get Tomac to net fourth. Behind Tomac, Brayton and Canard were chasing each other. Canard almost caught Brayton, but Brayton kept pushing and caught up to Tomac, and all three were close coming across the line for fifth sixth and seventh. Brayton was happy with his ride but feels he let the race get away from him by taking a bad line through the whoops for the first few laps, and that’s what allowed Seely to get away from him. 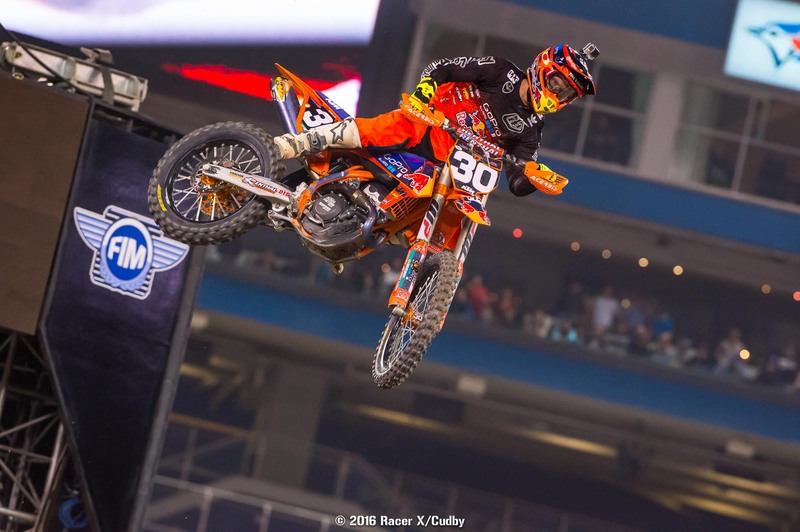 The 250SX main event was perhaps one of the craziest races in recent memory and in the end, TLD Red Bull KTM’s Justin Hill stood atop the podium with his first win of the season. It was the second 250SX win of his career at that. Hill was really fast at the first two rounds of 250SX this year coming from the back and it was a forgone conclusion that if he got a start here in Toronto, he could walk away with this one. And he did just that here with a massive lead but was also helped by a first turn crash that took down GEICO Honda’s Malcolm Stewart and Yamalube Star Yamaha’s Jeremy Martin among others. Hill made the pass on his teammate Shane McElrath early on and stretched out his lead to over twenty seconds at one point. 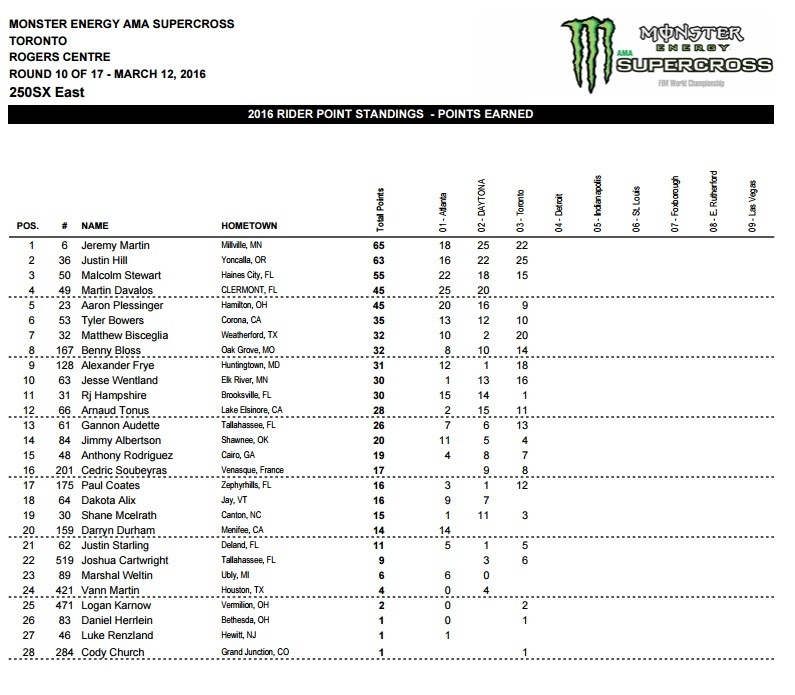 Hill’s ridden very well at all three rounds and sits second in the points. After the race he told us he’s happy with the win, but is keeping it all in check because his real goal is to get the points lead. The race saw McElrath run second for a while before a flat took him out—at one point the TLD boys, with Hill, McElrath and Alex Frye, running in formation in second, third and fourth early. The Hill and McElrath were running one two before McElrath had to go into the mechanic’s area for a change. That gave second to MAD Suzuki’s Matt Bisceglia who’s had a rough start to the season. Matt ran second for a while until Martin came from way back to pass him for the runner up position. Bisceglia held on for third, a big turn around for his season. It was an amazing ride by Martin and allowed him to take the red plate in the series as points leader Rockstar Husqvarna’s Martin Davalos didn’t race due to a “family issue” that’s widely believed to be a travel VISA issue. Jeremy’s charge was something to be seen and props to him for overcoming adversity to lead a 250SX series for the first time in his career. Stewart pulled into the mechanic’s area twice to fix his bike that was running poorly. The team cut a wire on the ignition (believed to be a kill switch) and fixed the issue. Malcolm overcame that crash in the first turn and two stops in the mechanic’s aread all the way to sixth. Great ride by him and quick thinking by the team. Monster Energy Pro Circuit’s Tyler Bowers looked much better in Toronto than he had when he won a heat and early on in the main ran third. He crashed at one point, dropped back to around ninth before working up to fifth. But then privateer Jesse Wentland passed him for fifth on the last lap and Bowers ended up crashing a few moments later—and ultimately ended up ninth. As far as flats, McElrath got one, and so did GEICO Honda’s RJ Hampshire, who told us he cut it on a footpeg in the first turn crash. Hampshire cruised around early on with one before pulling into the pits as well. Last time we saw three flats in a SX main event? How about never? Weird deal here in Toronto. Privateer RSR Honda rider Jesse Wentland has been fast to start the year even with a DNF at the opening round with a crash. In Toronto the #63 fell in the second turn and still worked his way up to a career best fifth place behind another rider with a career best in Alexander Frye. Great rides by both riders--golf claps to them. Martin’s teammate Aaron Plessinger crashed off the start in his heat when Stewart cut over on him and then was forced to the LCQ to get into the main event (which he won). From there he was involved in that first turn crash and didn’t have a great night ending up in 12th. Oh, wait! We asked Davalos' Rockstar Energy Husqvarna team owner Bobby Hewitt about it, and he is sticking with the, "Marty has a personal issue to attend to, he is with his family." So there's that. Whatever it is, Hewitt says the hope is some of the other riders further back in points, like say Tyler Bowers, run up front and take points away from series' front runners like Malcolm Stewart, Justin Hill and Jeremy Martin, who are currently right behind Davalos in points. The thinking is that Cooper Webb DNFed a race in the West and still holds the points lead, so one non-start for Davalos might not be the end of it. Rockstar Husqvarna's Christophe Pourcel is also not here. Now, with rumors of Davalos' VISA issues, people started thinking that maybe the Frenchman Pourcel was also staying away from Canada for the same reason, but Hewitt literally showed us X-rays of a small fracture in Pourcel's neck. That sounds scary but we're talking a small, pencil-point sized piece broken off the end of a vertebrae. Doctors think after a few days of scar tissue build up, Christophe will be okay and could possibly race next weekend in Detroit. As for the Toronto track, it looks good. Dirt is sweet, there are two sets of legit whoops, and five good 180s to make passes, four of them with huge berms. Nice. A few milestones to watch in the 450 class. Ryan Dungey has now tied Chad Reed's all-time mark for 450SX consecutive podiums, so a trip to the box tonight will clinch a new record. 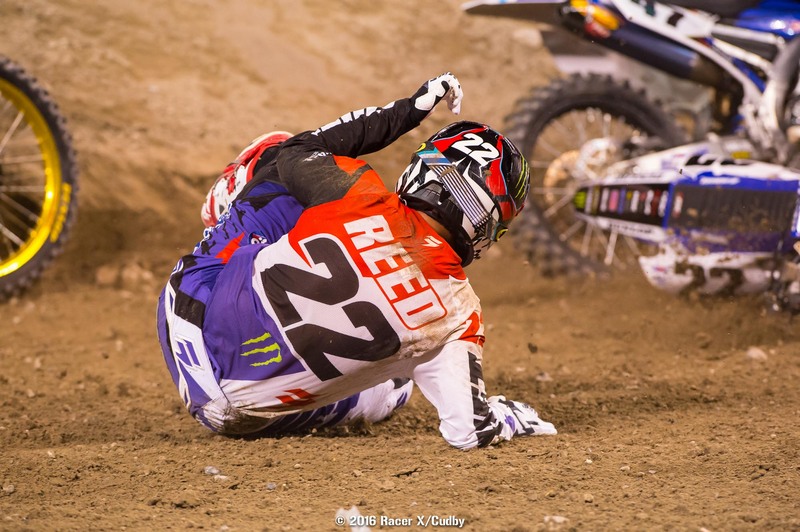 As for Reed, he is of course here as well, so maybe he could have a hand in ending Dungey's streak? Chad also told us he has one more chance to win a race at age 33--he'll turn 34 in three days. More chaos right off the bat in this one, although it didn’t come in the form of a first-turn pileup, unless you count Chad Reed going down on the start stretch and crashing out. The real carnage started when leader Justin Bogle came up way short in a rhythm section, went down, and took several riders with him, including Jason Anderson, Deven Raper, Tommy Hahn, and more. Eli Tomac narrowly avoided getting caught up in it too. When Bogle was finally able to come up for air, miraculously unhurt, Ryan Dungey had taken the lead with Tomac and Ken Roczen right on him. They wasted no time in passing Dungey, and the two proceeded to put on a short, but fierce, battle. A lap later Roczen stole the lead and started checking out. Then Tomac made a mistake in a rhythm section which allowed Dungey by in the next corner. But then Tomac retaliated and took the spot right back! 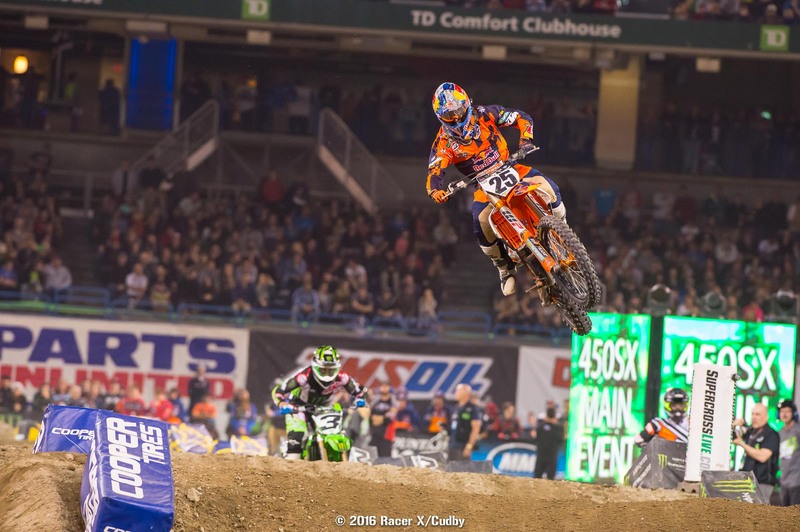 The battle raged for a quite a while until Dungey finally took the spot just before the halfway point. A couple laps later Marvin Musquin also went by Tomac. Up front Roczen was three or four seconds up on Dungey but there was plenty of time for Dungey to try to make something happen. Roczen wasn’t having it though and refused to let Dungey cut into his lead. Then Dungey lost some time and Musquin, who was absolutely ripping, got by into second. Behind them Tomac’s slide continued, coughing up fourth place to Cole Seely. He nearly lost fifth place to Justin Brayton at the end of the race too but was able to hold on for a top-five finish. Roczen took the win, Musquin second, and Dungey recorded his worst finish of the season, a third, and broke Chad Reed's record of most consecutive podiums. Dungey now holds the record with an astounding twenty-six straight 450SX podiums. The start of the 250SX main was chaos. Riders were betting bounced around, and it ended up in a huge pileup in the first turn, including names like Jeremy Martin, Aaron Plessinger, Jimmy Albertson, Arnaud Tonus, RJ Hampshire, Malcolm Stewart, and more. The benefactor was Matt Bisceglia, who rode off with the lead, followed by Shane McElrath, Alex Fry, Justin Hill, and Tyler Bowers. Frye got shuffled back pretty quickly, but would make a comeback later and take fourth. Bisceglia started losing positions too, but like Frye, would hang tough in the later stages and motor back to a third. The first two riders to get by Bisceglia were Shane McElrath and Justin Hill. One lap later Hill snatched the lead from his teammate and started pulling away. Stewart meanwhile was coming from the very back after a visit to the mechanics area, most likely prompted by going down on the start. Amazingly, he was able to work his way back up to sixth. That’s some serious damage control in the points! McElrath had a flat tire halfway through the race while running second and pulled into the mechanics area to have his rear wheel swapped out. Hampshire had the same problem with just a few laps left in the race. And Martin? He put his head down and dropped the hammer, smashing through the pack after getting collected in that big crash on the start. A little past the halfway point he’d already worked his way into second. That’s as far as he could get though, as Hill had been killing it up front and had a huge lead. Hill would go on to take his first win of the year, with Martin and Bisceglia joining him on the podium.